It’s a brand-new year and a brand-new I am a Food Blog! Okay, not completely brand-new, but Mike did do a little re-design, which you can read a little bit about here. The start of a new year usually means that people are on the look out for recipes that just a wee bit healthier. 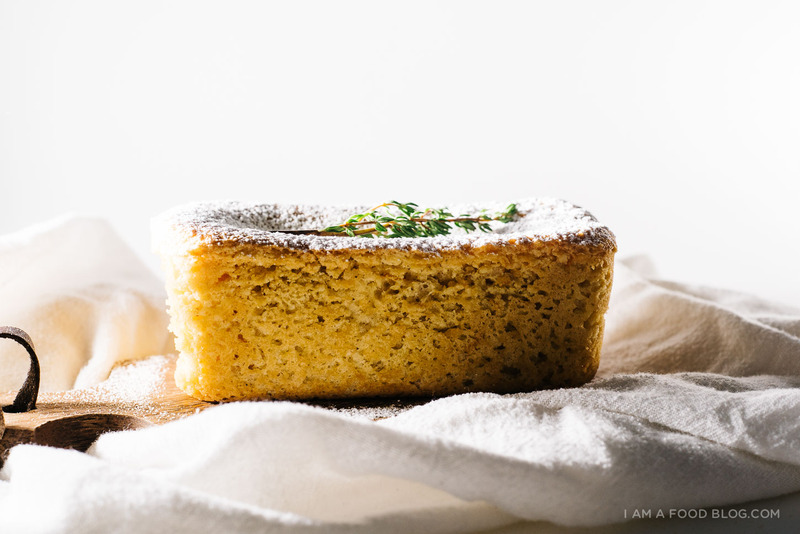 I’m not really one to be all fanatical about the healthy stuff, but I do think this cake is nice, light and perfect if you’re looking for something sweet but not too crazy after all of your holiday indulgences. Plus, starting off the new year with cake for breakfast is something I can definitely get behind. This cake is tender, lemon-y, and light (due to the whipped egg whites). If you don’t have any almond flour on hand, you can always use your food processor to make some, but I like having a bag kicking around in my pantry. Almond flour is great for the obvious (macaron) and the not so obvious (almond chicken fingers). 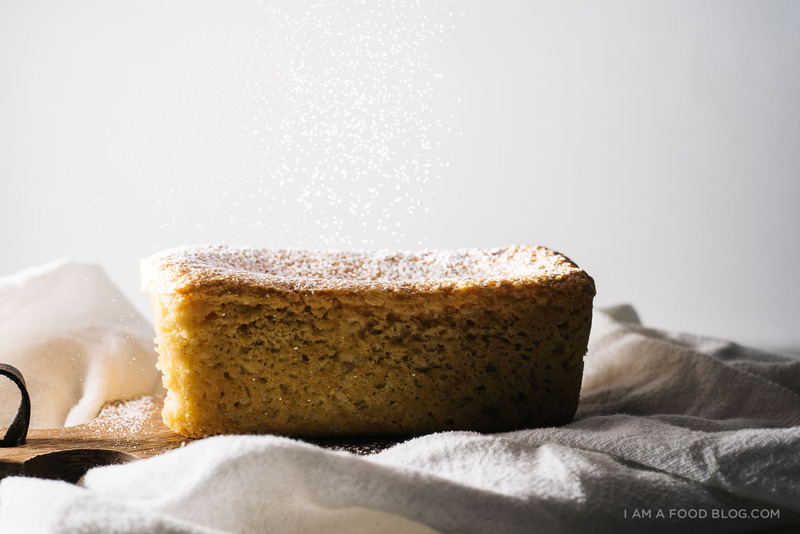 I get the feeling that people think that almond flour is a specialty sort of ingredient – mostly for gluten-free baked goods – but the truth is, I really like baked goods made with almond flour. It lends a moistness and chewy texture that I’m really in to. Other things I’m really in to: New Year’s Resolutions. Are you guys resolution types? When I was younger, I never really believed in them, but now that time keeps marching on, I like to take some time at the end/beginning of the year to reflect on what I’ve accomplished and what I want to focus on. 2014 was a crazy year and I’m hoping 2015 will be just as wild. My 2015 resolution: be fearless. Two tiny words, but I’m hoping that this year is the year I learn to judge myself less, be a little more secure, and live my life without reservations. 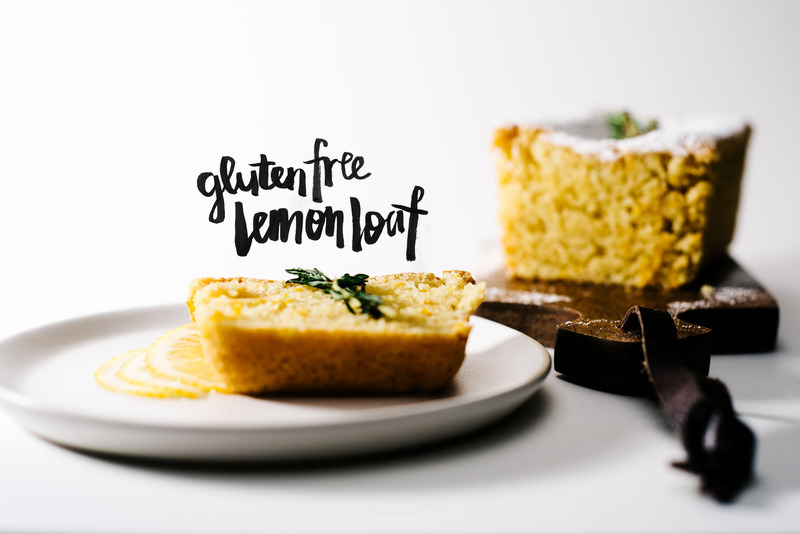 Cheers to fresh starts, learning to love ourselves, gluten-free lemon loafs, and to a brand-spanking-new 2015! Preheat your oven to 350°F. Lightly butter or grease your loaf pan (I used a small loaf pan, similar to these). Separate your eggs carefully: yolks into a medium-sized bowl and whites going into a large absolutely grease-free bowl. You need to make sure the bowl of whites have absolutely no fat – this will help them whip up nice and fluffy. Lightly beat the yolks and add the zest and 2 tablespoons of sugar. Mix until smooth. Add the ground almonds, baking powder, and cardamom. Mix until smooth. 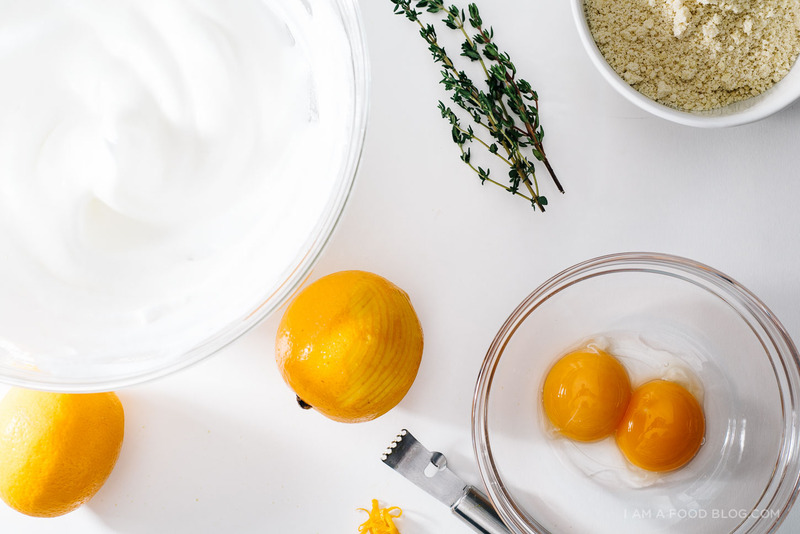 With an electric mixer, or good old fashioned elbow grease, whip up the egg whites until they start foaming. Sprinkle on a pinch of salt, which will help the structure of the whites. As they start increasing in volume, sprinkle on the remaining 2 teaspoons of sugar into the eggs as you beat until soft to medium peaks form. Fold a small amount of the whites into the yolk mixture being sure not to over mix. Gradually fold in all the whites, a bit at a time, being sure not to deflate. You should have a light and fluffy batter. Pour the batter into your prepared pan and bake for 25-30 minutes. Remove from the oven and cool. Lightly dust with icing sugar and enjoy with thinly sliced lemons and thyme sprigs. This cake is a total stunner. I love the lemon and almond combo! Don’t we all wish we could live life a little less fearfully? I am glad you are taking on the challenge and I am sure your blog will benefit for it too! Lovely, bright summery cake. 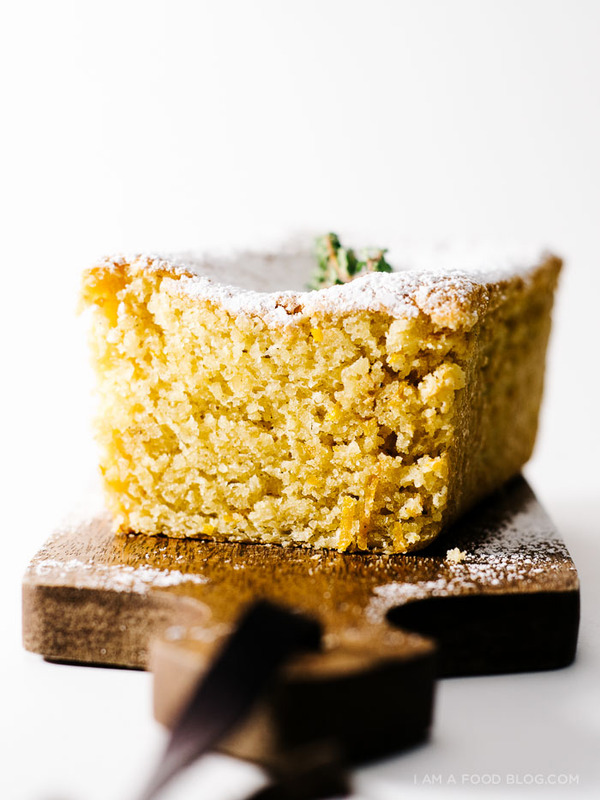 That texture is perfect for a flour-less cake with no oil too? Genuis! I’m back to cleaning up my diet and cutting back on processed carbs. Thanks for posting this nice, simple loaf. It will be the perfect compliment to my Greek Yogurt. This looks wonderful, and the fact that it’s flour free is great! I’m sure I can make this for relatives who are gluten free and they would adore it! Hope you’ve had a lovely weekend Stephanie! This cake is just perfection ! The texture seems perfect ! thank you so much maïa! i really did love the texture! Love the design tweaks. Love skipping lines for brunch at home. And love that font! Did you hand letter?! You’re good, real good. Happy new year my friend! the website spruce up is great!! it used to be a little glitchy on my phone, but now it’s perfect. love it! also this cake sounds amazing, a low carb cake!! yay!! thanks and i’m glad to hear it isn’t glitchy on the phone anymore! thank you so much kyriakos! This recipe sounds so delicious, Stephanie! I can’t wait to try it! I totally get the “judge myself less” thing – I don’t know why that is so hard to do, but it really is a challenge, isn’t it? Maybe its because we are literally putting our hearts on the paper for every one else to judge, that its hard not to do it to ourselves. Or maybe we just know what we are capable of, and if we don’t meet that we are disappointed in ourselves…or maybe I am just speaking for myself haha! Anyway, I wish you a happy 2015, and totally, be fearless! I love your resolution. Mine was to eat more pies at Swanton’s Farmstand. pies are ALWAYS a good resolution! thank you so much abby! lemons and almonds forever! Eeeee!!! Two of my favorites all in one dish: lemon and almond!!!!!! Brilliant. I’m not one for resolutions either. I haven’t made any kind of goal list, but then again, I never do. Maybe that’s why I’m all over the place. Last year I decided to live according to this question: What would you do if you had no fear? And I do my best to continue to live that way… happy new year to you and congratulations on a smashingly successful 2014! Tried your receipe, the egg yolk part becomes very crumbly, which makes the folding impossible. The egg white is peaking but not moiste enough to melt the egg yolk crumble. Any suggestion? There could be a couple of things happening. Are you using large eggs? Also, the almond flour should not be packed into the cup – fluff it and then spoon into your cup measure. What do you mean by the egg white is peaking? When you’re folding the whites into the almond mixture you need to fold in a little white at a time to loosen it up before folding in all of the whites. Also, it’s not the thinnest batter – scoop it into your pan as opposed to pouring it. Hope this helps! Your cake looks amazing! i have made this cake exactly to your directions and recipe. and it’s nowhere near as high as your loaf. Any tips? Eggs were fresh with orange yolks. Almond flour. baking powder. im pretty sure i had all of the listed ingredients and whipped the egg whites until soft to medium peaks and folded it gently. maybe not gentle enough. what size pan did you use? i used a mini loaf pan, which makes it look a lot taller. did you fold a bit of the whites into the almond mix first and then fold in the rest of the whites gradually? I love this cake! I made it today – substituting maple syrup for sugar – and it was beautiful. Thank you for the recipe! I love lemons! These loaves look so tasty. Thanks for the GF recipe. 1) The loaf is smaller than it looks. I went out and bought the MINI tins and the batter only filled one mini. If making this for brunch for a group, you’d need to make at least 2. 2) If you grind your own almonds, make sure to grind super, super fine. Mine were a bit course and it really impacted the texture of the loaf, and not in a good way. 3) Measure exactly with the cardamom. I used a slightly heaped 1/8 tsp and the loaf was very strong on the cardamom flavor. This was a disaster for me, as it was for other readers. It makes a very small amount and it’s difficult to mix according to the instructions. I would definitely recommend making the larger recipe that the loaf is based on. 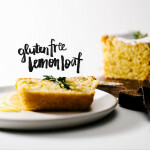 The whole idea of this lemon/almond combo is so appealing, so I want to make it work one way or another!! Made this loaf, excellent, very good. The changes I did was to double it, and only use 3 lemon rinds.i put it in a regular sized loaf pan because that was all I had, and cooked it for almost double the time, I just kept checking the surface with my finger, til it was solid feeling. (At 30min it was mushy on top) the cake is very light, not dense. I also ground my own almonds and then sifted out the larger pieces and scooped into a measuring cup, I did not compact the almond flour. I will make again. whoops. sorry my bad – I used 2 sons salt instead of sugar. Shouldn’t bake when tired. Hi, I want to know if the cardamom should be in whole seeds or in powder? Thank you. I am absolutely in love with your photography. Gorgeous loaf! oh and that type is LOVE. Love this recipe! so light and you wouldn’t be able to tell its gluten free! Delicious dessert! I did have to add a bit more egg (about 1/4) to the batter before adding the egg whites. Served with fresh raspberries and sweetened whipped cream. Everyone loved it and they are not a gluten free crowd. Will make it again-as my husband is gluten free. So there’s no oil/butter in this recipe at all? hi ed, that’s right – the fat is from the eggs! Not sure if I will make this again as the amount is really a teaser haha for the work it takes! Taste was lovely with regular lemons vs Meyer plus I added a couple tsps fresh chopped lemon thyme, wow. I’m glad I read many many comments first because I ended up adding 1/4 c real maple syrup before folding in the eggs, as someone recommended, otherwise you’re dealing with a very stiff cookie dough. It turned out great texture so I can’t imagine that without the maple syrup it would have been anything but a waste of pricey ingredients! Definitely not too sweet either nor too wet. There ya go! Thank you for this recipe. I just made it and with out the cardamon, did not have any in the pantry so I went ahead and made without it. to my surprise it was superb, light but very moist. I will make it again this coming weekend for the community garden sign up day. Thank you very much. Sounds perfect for my lemon craving. Can the recipe be doubled? I have a crowd for Easter brunch. I love this! I’m twelve and baking is one of my favorite hobbies but my mom is gluten free. I made it once before and so I decided to make it again but I couldn’t find it for a while. I literally searched for an hour to find this exact recipe. I used coconut flour though because we didn’t have almond. With coconut we had to double the yolks and whites but it worked great! Thank you for this wonderful recipe! I don’t know how any of you got the whites to fold. My almond meal and egg yolks were too gooey with no liquid. did I miss something? followed verbatim and total failure. 1/4″ high,. hi tina! so sad your loaf didn’t rise. what size eggs did you use and how coarse/fine was your almond meal? the almond meal egg yolk mixture is pretty gooey – did you fold in just a bit of whites to start to lighten up the egg yolk mixture? I just made this loaf and it was absurdly fluffy – like eating a lemon omlette. I doubled the recipe so it would work in a regular loaf pan. Otherwise followed instructions fully – maybe I over-beat the eggs? It rose gorgeously and then fell a bit when cooling, but I don’t know if the texture is correct at all. It seems like an incredibly light texture for a ‘loaf’ or a ‘cake’! it’s definitely a light crumb due to the lack of flour. was it tasty?! I found your website by accident, and what a wonderful accident it was! I am making this recipe for Passover. Can I make it in advance and freeze it? 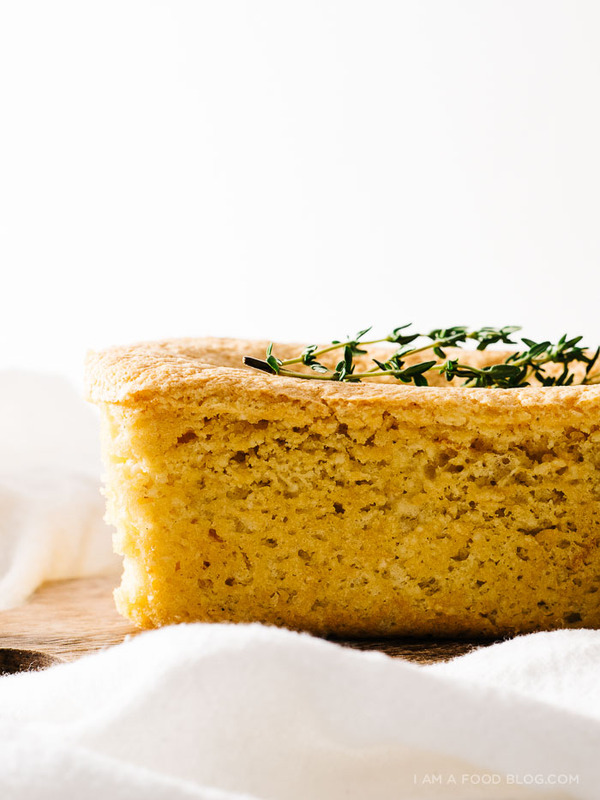 I double the recipe because it does not rise very high..
Love the recipe because it is not too sweet and with meyer lemon season ending in my area(Canada) I substitute orange zest and it is just as good!!!! !